What keyboard and mouse do you use, is it the one that came bundled with your PC? The last couple of PCs I ordered I made a point of making sure they didn’t include a cheap, budget keyboard. Instead I ordered my own. Recently I’ve been on the hunt for a replacement for what has long been my standard, trusty keyboard, the Microsoft Digital Media Pro. In practice I always remapped the Calculator hot key to open My Documents as it was the closest reconfigurable key to my mouse; the shortest distance for my right hand to move. I rarely if ever used the zoom slider, and since upgrading to Windows 7 I stopped using the My Favourites, as you can achieve something similar by holding down the Windows key and tapping a number (Win+1 will open the first application pinned to your taskbar, Win+2 opens the second, etc.). Similarly, I rarely used any of the other hot keys. In the end I realised that the only extra keys that I used regularly were the four media keys. And after six years of constant use I was beginning to get very sore fingers after typing with it, not to mention prolonged bouts of RSI. It was time to get a new keyboard, both at home and at work. I like to use exactly the same keyboard in both locations so that I don’t have to think about where my fingers should go. I spent a few weeks researching what kind of keyboard I should buy, investigating the options, and weighing up the pros and cons. USB or PS/2? wireless or wired? mechanical or membrane? 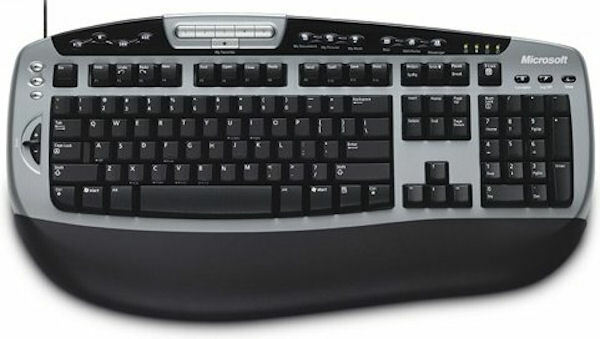 In the end my fingers were getting so painful I just ordered a really cheap Logitech Media Keyboard K200 as a stopgap. It cost me about £9.99 GBP. The K200 is a full-size, 105-key keyboard with four media keys, and four hot keys. For a keyboard so cheap I was quite surprised by how comfortable it was to type on. What let it down for me, however, was how flexible it was. When the adjustable legs were flipped out the whole keyboard bent in the middle whenever I typed on it. As a temporary solution, however, it was perfect and within a few days my fingers were no longer hurting and the RSI was calming down. Time to find something more permanent, though. I first spotted the Logitech Wireless Keyboard K360 in a gear review in .net magazine (issue 224, February 2012). The verdict of the review was “we found this to be a very comfortable keyboard to use, and — as wireless keyboards go -— it’s well worth checking out”. I wanted something simple and and non-distracting, so I ordered the black one from Amazon for £19.99 GBP. The K360 uses Logitech’s Unifying receiver, a small USB dongle that plugs into the PC and which can be paired with up to six devices (keyboards and mice). I discovered pretty quickly that this needs to be plugged into a the PC itself and not into a USB hub. I multi-boot my PC and the USB hub wasn’t available during the power-on test so the keyboard was still unresponsive when it reached the boot menu. Plugging the Unifying receiver into the USB port on the front of my PC tower, however, fixed that. As far as the keyboard itself goes, it has the feel of a very nice laptop keyboard, with its low profile and ‘Scrabble tile’-like keys. The keys themselves are good sizes and very easy to use. The travel is very short so you don’t need to use much pressure to type with, which was great for my wrists. You can lay the keyboard itself flat on the desk, or flick out two little legs to raise up the keys a little. I found that arrangement more comfortable and meant that the keys were all easily reachable without having to move my hands too much. I did find, however, that overall the keyboard did feel to be a little smaller than standard and my fingers did begin to cramp up after a few hours typing. And with it being a compact keyboard, like a laptop, the position of the ‘editing block’ keys had also been moved: the arrow keys, insert, delete, home, end, page up and page down keys, as well as the print screen, scroll lock and pause/break keys. That was the thing that I found most frustrating and which led me to looking for something else. For years my fingers have just known where to go to grab a screenshot, or move the cursor to the end of the line. With this keyboard I couldn’t just get on with typing, it slowed me down, it forced me to think about the device, it forced me to keep looking down to locate the keys. 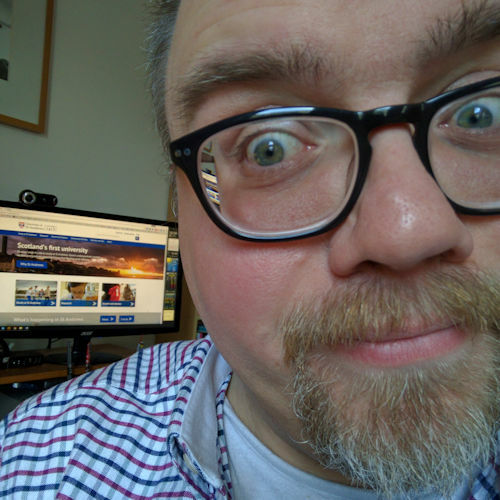 I gave myself a couple of weeks working with it to see how quickly I could adapt, and to be fair, by the end of the fortnight I was feel much more comfortable with the keyboard. I was able to locate the moved-keys more quickly but it still didn’t feel natural. What I did find very useful, however, were the media keys (previous track, play/pause, next track) and the volume keys (volume up, volume down, mute). I liked that the K360 didn’t have lots of extra keys cluttering up the design (like the Microsoft Digital Media Pro), but I did find those six extra hardware keys very handy indeed. In short, though, overall the keyboard’s compact layout got in the way of my typing, and that’s not a particularly efficient way to work. I needed to find something else. That was when I opened the latest copy of .net magazine (issue 227, May 2012) and spotted a review for the Logitech Wireless Solar Keyboard K750. The review itself wasn’t exactly glowing, “spending over £60 on a keyboard that’s nothing special design-wise seems crazy to us, but it’s your call” but it looked exactly what I wanted. I ordered one from Amazon for £49.98. The K750 paired very quickly with my existing Logitech Unifying receiver and I was good to go. It has a similar low profile to the K360 but is wider. It has more of a feel of a full-size keyboard and before long my fingers were finding the ‘editing block’ keys again (insert, delete, home, end, page up and page down) without my having to look down at the keyboard. Perfect! The keys themselves are a little different to those of the K360: they are slightly dimpled which makes them feel surprisingly comfortable to type on. Your fingers sit easily in the hollow of the keys. Logitech calls this “hand happiness”: “Treat your hands right with keys that feel good and make every keystroke comfortable, fluid and whisper-quiet.” And they are right. There is only one additional hardware key on this keyboard, to the right of the Pause/Break key. Press it and one of two LEDs lights up, next to a happy face or a sad face, to indicate whether the keyboard’s built-in solar panels are receiving enough light to top-up the rechargeable batteries. Logitech claim that even in total darkness the batteries would last for three months. Perhaps not long enough for Gollum to write his memoirs but certainly enough to get you through the night on a long coding or writing spree. Typically, I regularly use the media and volume keys, and have once reached for Fn+F4 to launch the calculator. Thankfully these additional, and mostly extraneous options, are unobtrusive. I really wouldn’t have missed them if they had not been available, but I guess these days such media keys almost come as standard as though providing a solid, comfortable and highly usable keyboard isn’t enough. At last! This is the keyboard for me. 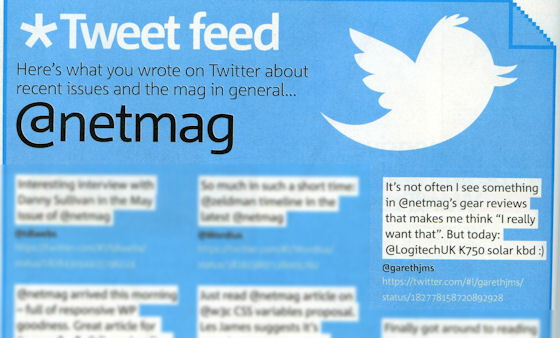 What a very pleasant surprise this morning to discover that I’d been quoted in .net magazine’s Tweet feed round-up on page 12 of the latest edition (issue 228, June 2012) which dropped through my letterbox this morning. And it’s true. I’d just bought a new keyboard (the Logitech K360) and then I spotted the larger K750 solar keyboard and I have to confess that I coveted it. During Lent. And a month later it is, and I have a keyboard up for sale on eBay. But that, I suspect, will be the subject of another post, another evening. I’ve just spent, on and off, about 2 hours trying to work out why the media keys on my Microsoft Digital Media Pro keyboard weren’t working properly with Winamp 5.541 Pro. I’ve finally managed to solve the problem by rolling back to older keyboard drivers. It appears that the Intellitype 6.3 drivers aren’t compatible with Winamp 5.541 Pro. When I reinstalled Windows XP Professional a couple of weeks ago I did as I was supposed to: I installed the latest keyboard drivers (Intellitype Pro 6.3). But when it came to setting up Winamp I discovered that it didn’t work as expected. Global Hotkeys are keyboard shortcuts that you can use from within any running application. And here you can “enable default multimedia key support”. My keyboard (the Microsoft Digital Media Pro) has multimedia keys, so what could be more simple? I ticked the option, both options in fact, and closed the preferences dialog box. Pressing the Play/Pause button once started the MP3 track. Pressing it again paused it. Success! But then I minimized Winamp, pressed Play/Pause again and Windows Media Player started. Eh?! I tried a variety of solutions on the Winamp forums. Tick one, close, stop itype.exe, restart Winamp, reselect the option, close Winamp, start itype.exe … all that jazz. Nothing worked properly. I know that it worked with the last Windows installation, and I knew that I’d used the Intellitype 6.1 drivers, so I uninstalled Intellitype 6.3, rebooted my PC and reinstalled version 6.1. What I’ve had to do in the Intellitype options is disable the Play/Pause button (because enabled it was still opening Windows Media Player) but it didn’t have any effect on Winamp’s ability to recognise or use the key. Now when I press Play/Pause, no matter whether Winamp is minimized or maximized it toggles play and pause. Intellitype 6.3 appears to offer a few new features not present in 6.1, such as the ability to save keyboard profiles, but to be honest I don’t need such a facility. So long as my keyboard shortcuts work and my multimedia keys control Winamp I’m a happy user.